The JEC Europe International Composites Show and Conference takes place in Paris every year. The world’s leading trade show, which has expanded significantly in the past few years, offers a comprehensive overview of the complete value chain of composites – ranging from raw materials and composite production to follow-up services. In this innovative environment, Hennecke GmbH presented an extensive lightweight portfolio at its booth. The focus of Hennecke’s trade show appearance was on the High-Pressure-RTM process (HP-RTM). Thanks to very short cycle times, this technology allows high-quality fibre composite parts to be made in large-scale production. At the exhibition stand in Paris, visitors could experience the impressive products that can already be manufactured. Another part attracted particular attention: the seat shell for the BMW i3. 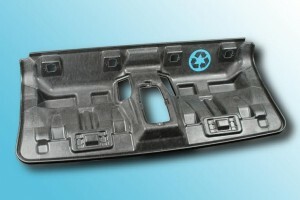 The carbon fibre component is a consistent combination of lightweight construction and sustainability because a large part of it consists of carbon fibre recycling material from the production of the BMW i3 car body. And there is another special feature: For the first time, carbon fibre materials combined with a PUR matrix are used in a series-produced car. This is possible because of Hennecke’s PUR-CSM spray technology whose efficiency in terms of uniform and reproducible distribution of the spray coat is also continually confirmed in the production of PREG components such as load floors and headliners e.g.